Last week, NewsBuster Geoffrey Dickens introduced readers to Maureen Faulkner, the wife of a Philadelphia police officer killed in 1981 by former Black Panther Mumia Abu-Jamal. As Dickens reported, Faulkner was rudely treated by NBC's Matt Lauer on last Thursday's "Today" show as the host seemed to take the side of Mumia supporters who to this day avow his innocence. One week later, Faulkner was WOR radio host Steve Malzberg's guest, and took the opportunity to not only air her feelings about Lauer's performance, but also to address a reporter that spit on her leg outside of a courtroom in 1982, as well as others that shouted things out at her like "We're glad your pig husband is dead." Matt Lauer should be ashamed of himself. 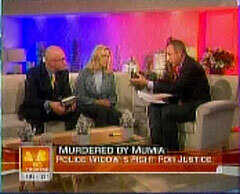 You were constantly put in the position, "Well, what if Mumia didn't do it? Did you ever think of that?" And questions along those lines, which, I mean, how you kept your cool. I would have walked off the set. MALZBERG: How did you feel? I'm sorry to interrupt. How did you feel while you were sitting there, you know, listening to these questions that were basically, could have come from a Mumia supporter? FAULKNER: I was shocked at two of the questions. One was with Michael [Smerconish] the question he asked him. I mean, Michael has been with me on this case for fifteen years behind the scenes helping me and has never, ever, ever taken a penny. And for him to ask, say to Michael, you know, personal or financial gain was insulting. And for me, to say, "Do you ever sit alone and think that maybe his Mumia Abu-Jamal supporters are correct," what a question to ask the widow of a police officer that has gone through the 1982 trial, the '95, '96, '97, '98 conviction relief act hearing. I was in court this past summer which, the 3rd Circuit Court of Appeals. The case is back in court again for a technicality. And, this is the disgrace that the family and I have to go through that, Steve, all I can say is, "Wake up America!" Think of the survivors and the victims of crimes and what they have to go through with appeal processes for year after year after year. And they have to go into court and look in the eye of the person that murdered their loved one. In the 1982 trial, I was coming out of the court one day, and one of the news members spit on my leg and they would say things like, "We're glad your pig husband is dead." *****Update: NewsBuster "vjguercio" alerted me that Faulkner might have said, "...one of the MOVE members spit on my leg and they would say things like, 'We're glad your pig husband is dead.'" MOVE is an organization which was formed in Philadelphia, Pennsylvania in 1972 by John Africa (born Vincent Leaphart) and Donald Glassey. MOVE was described by CNN as "a loose-knit, mostly black group whose members all adopted the surname Africa, advocated a 'back-to-nature' lifestyle and preached against technology." 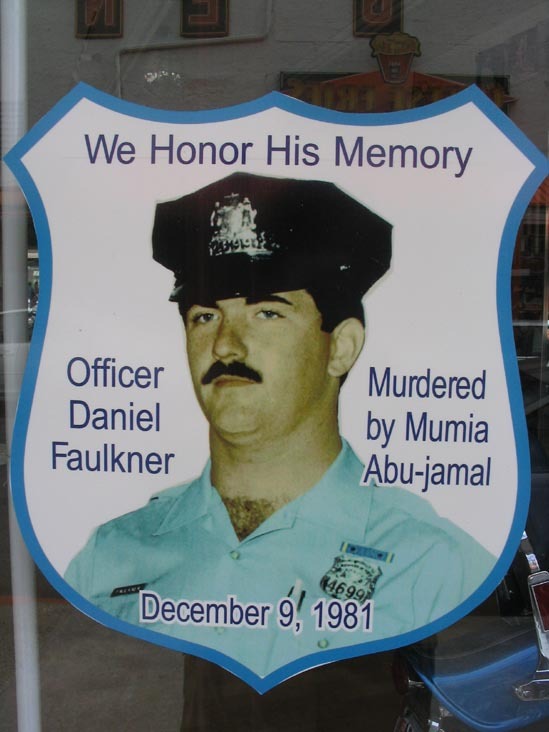 The group was impacted by a 1985 bombing by the Philadelphia Police Department, in which eleven MOVE members died, including founder John Africa. Mumia Abu-Jamal (born Wesley Cook) is an active supporter of MOVE, and penned a 1998 letter titled Long Live John Africa! I've listened to this clip several times, and Guercio might be correct. Anybody else hear her saying "Move" and not "news?"